beautiful rug, very happy with it. i have gotten many compliments on it. very good quality and adds a lot of character to my living room. would definitely recommend this item! I am IN LOVE with this rug. For a while all of the sheepskin rugs were sold out on Overstock, so when they came back I jumped on it! I wanted a sheepskin rug to put right next to my bed. The 3x5 size fits PERFECTLY. It's so so lush and soft and amazing. I don't have any pets but I make jokes that the sheepskin rug is my puppy because of how soft and cuddly it is. 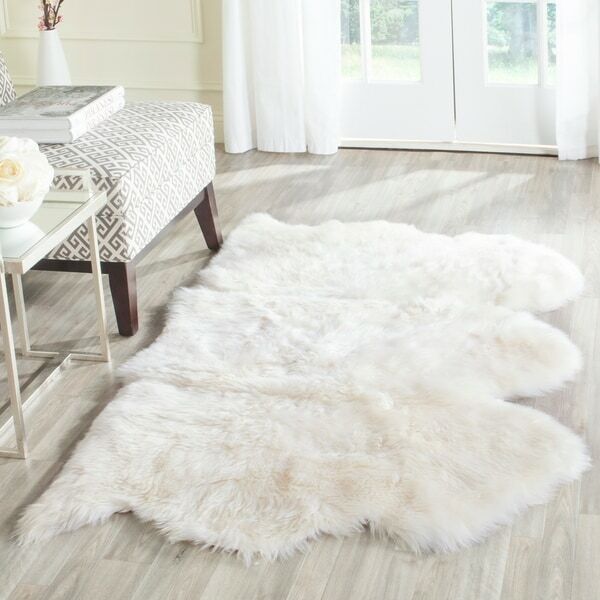 This is one of the best purchases I've made on Overstock - I highly recommend it if you are in the market for a sheepskin rug. This shag rug is very plush, soft and just beautiful. I have it placed at the foot of my bed. Don't hesitate to purchase if your looking for a sheepskin shag rug. The picture doesn't do it justice. I ordered this rug, along with the 2'x6' runner despite the reviews regarding color. Figured I would take my chance for the price. Well the runner came and is perfect! However this rug came, yes with a slight smell but the main reason I gave it a 2 star review is because the color is so off and yellow (not the natural, slightly off white they usually are) the weird yellow color this rug came as is completely off. It's ridiculous that they even sent it out and listed it as "white". I even tried it in a my neutral room w beiges and creams, this rug has a YELLOW tint to it. Not workable at all if you want a white or even a cream rug. I don't know where the companies quality control is, or if they even have one. But it boggles my mind they let a product like this be sent out. If you are able to take a chance do, you can't beat the price and as I said, one of the pieces I ordered is amazing ... however if you don't have the time or money... please don't waste it here. Gorgeous creamy white color! Very pleased with size, shape, & color! Pros: Super thick and soft. Nice and bright white with even color throughout. Has a nice straight edge to align with furniture. Cons: Doesn't look like the photo. Difficult to clean without a hand vac. I bought this hoping that it would have one straight edge so I could put it up against my bed. It did. It doesn't look like the first photo on the gray floor with the chair. I was banking on the additional photos being accurate because of reviews here. It is so comfy! I have been laying on it instead of sitting on any of my furniture. The occasional pine needle has found its way into it every now and then, and I think I'll need a comb/brush to handle cleaning. I don't want to pull fibers out with a large vacuum. I bought a sisal rug a few weeks ago in a solid espresso color, and it is a nice rug, but looked so plain. I thought that layering a lighter rug over the sisal would be a good idea to add a bit more style to the room. I searched tons of sites, both high and low end, and then I cam across this one on Overstock. For the price, size, and quality, this rug definitely turned out to be a a great deal, and the best I came across. Very happy with it. If another Safavieh sheepskin comes on here I will probably end up buying another one in the future for my bedroom. I love it, it's exactly what I wanted. It's soft, plush and thick. It adds a feeling of luxury and coziness to whatever space it is in. The size is perhaps a little off, but not drastically. (Now, the 2x6 rug's sizing skimp is another story, which I will be writing a review for, but the 3x5 I received more accurately reflects its measurements.) Like others have said, the rug is so luscious that I sometimes just lie on it on the floor and melt into a dream cloud. Just be open to slight sizing/shape/color differences and I imagine you will be incredibly happy with it. This big fluffy shag rug is of great quality. The color is creamy and the fur is lush. Couldn't be happier with this rug and would highly recommend it. Mine was a little bigger than listed on the site which was great for me it is thick and lush and I really love it. Great rugs at a great price. Very plush and luxe everyone keeps asking about them! I read a lot of reviews prior to buying this carpet. A lot of them talked about the color being more yellowish than the white pictured. I have to say that the carpet I received was a beautiful shape of white. My biggest disappointment came with the shape. It was not like it was pictured. The picture shows natural scalloped edges all the way around. The carpet that I received has this on three of the 4 edges. The fourth edge is cut completely straight and it looks very odd. I ended up returning it. Love! It feels so thick and amazing under foot. It does have a small at first. That airs out after a few days. I purchased this to put beside my bed and absolutely love it. I am ordering another for the other side. It is super soft and just the right size. I highly recommend this rug. I really didn't want to spend this much on the sheepskin rug, but I'm glad I did. It is very impressive and looks great beside my bed on the dark wood floor. Some of the reviews complained about the shape, one side being straight, but that works for me because thats the side I put next to the bed and it looks like a custom fit. Also, the rug did smell when it arrived, which is natural as it is an animal skin, I just put it out in the sun for one day and it lost all odor. I think its a great value; really love the look. Very white and very soft. No padding on back and did have a bad smell for a minute and faded away quickly. Wool is not super long, which is what I was hoping for, more of a medium length pelt. Still very nice. Really nice rug has a little yellow haze on it but overall a great rug. I bought 2 of these rugs for my grandchildren's nursery, they look very classy. The price is great and the size also. Great rug. Size was perfect to lay next to the bed. Loved that one end was straight as it layers under the bed, with the other side left out. Soft. The item was as represented. Makes a nice throw rug in front of master bedroom fireplace. Looks gorgeous on my field stone fire place hearth. Amazing quality, just beware of smell when it’s brand new. Mine had a strange smell for the first few days then it faded away and I also used a room spray on it. Otherwise it’s beautiful, and great quality. I was very disappointed when this arrived...it is not sheepskin wool as stated....is a polyester type fabric that sheds and the back is like a fake suede. "Hi after reading the reviews I am confused what the measurements are. Will someone please let me know. Thank you "
This rug is approximately 3 feet x 5 feet. "Approximate" because the shape is irregular. As another poster said, one edge is straight. The other edge is tri-scalloped. For comparison sake, it's the perfect length for the foot of a queen sized bed and almost runs the full length of the side of a queen bed. "i'd also like to know if this may be washed please and thank you"
The label says professional cleaning....I have two ... would not recommend washing. No, this can't be washed. You would need to get it dry cleaned. "Can they be washed "
No, professional dry clean only. "Can these rugs be vacuumed? Want to use it in a beachhouse and so it will get sand on it"
I wouldn't. I would just shake it out. I have not had mine on the floor long as I am still remodeling and took it up to avoid the dust. I think the pile is too long and will wrap around the vacuum. That said, I may try one of the little hand held pet vacs from Bissel when the time comes. We recommend very light vacuuming on these shag rugs on higher height/lower power settings- it would be most helpful to vacuum the back first to loosen up the dirt. "How long does it take for the odor to go away, and does the smell linger even gaintly. I expected it but wow, its pretty overwhelming. Just started airing out today, I love the look and hoping I can put it in its place once the odor is gone." "The first image shows the middle pelt is flipped so the straight edges are opposite. The second and third photos show the pelts all facing the same way with one straight side. Which is it? Random?" These rugs are amazing! I have 4 of them in my house. None of mine have straight edges, the edges vary depending on the hide, the shapes are very similar but not exact because no animal is exactly the same shape. I hope this helps. The sheepskin material varies differently so each rug will be attached differently during each production phase. "Im confused by the photo.....is one of the sides straight edged....one pic looks like it is but the other is not????? Lyndsey"
One side is straight and the other is not. I can understand your confusion. Mine was straight on one side which I do not like. It was past the date for me to return it so I'm stuck with it. That first photo is not how mine is. My rug is like second photo - straight edge on one side.